If K2LD’s redesign of Melbourne’s Jasper Hotel is anything to go by, well-executed interior redesign projects don’t only deliver aesthetic benefits, but tangible commercial results too, with the hotel’s occupancy rates increasing by more than 25% and profit up by 17.65% since the refurbished hotel relaunched its new interiors late in 2015. The hotel underwent a $9million re-design, transforming the derelict gymnasium and ballet studio into 31 additional, premium suites surrounding an internal 880sqm atrium, another element of the re-design. The Colliers International Hotel Report YTD June 2015 states Melbourne’s average room rate growth is higher than any other state, as is the number of proposed new hotel developments to be delivered over the next 12 months. According to K2LD Architects Principal, Tisha Lee, in order to remain competitive in an increasingly crowded market, it is imperative to offer facilities and amenities of the highest standard, as evidenced by the Jasper Hotel’s return on investment since its re-design. Having previously worked with the hotel’s owner, Creative Wealth, K2LD was engaged to expand the hotel into disused areas of the property, and revitalise and create new public areas in order to attract the growing demographic of business travellers. 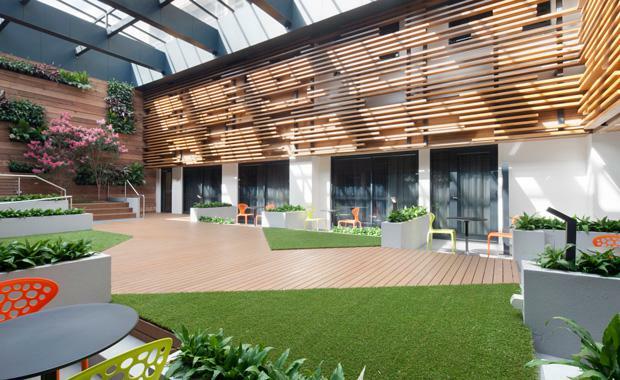 “By redesigning and expanding the business offering and conference facilities, and the addition of a large internal courtyard we were able to raise the bar for high-end, boutique hotel offerings in Melbourne’s inner ring,” Lee said. “We took a waning 66-room hotel, and turned it into a four and a half star 97-room hotel, which was a calculated risk for the client but turned out to be a profitable investment,” she said. With additional hotel projects in the pipeline in both Melbourne and Sydney, K2LD Principal Tisha Lee is confident the practice is best placed to deliver real value for hotel brands. “Inspiration for the Jasper Hotel redesign came from the Jasper gemstone, found in the desert of Western Australia and used by Aboriginals as a healing stone” said Lee. Each floor of the hotel is themed after one of the colours that appears on Jasper gemstones, with the colours yellow, mustard, white, brown, red, and shades of pink and purple mirrored in the suites. “Materials that are distinctly Australian were used including bluestone, sandstone and timber. Elements of outback Australia are bought indoors to the public spaces, including the pre-function space which utilises lighting to elicit the feeling of standing under a starry night,” added Lee. The hotel’s disused basketball court was transformed into a billabong-inspired atrium garden complete with desert poppies and a living native wall, delivering a stunning communal amenity to complement the 31 new rooms. The use of reclaimed wooden panelling has been used to reference the subtle sounds and rhythm of wind billowing through the natural surrounds, while providing privacy to the atrium-facing rooms.